This charming older home features a master bedroom, 1 1/2 bathrooms and a large kitchen and dining area on the main level. The master bedroom and both guest rooms, located on the second floor, have queen size beds. With both a living room and sunroom there is plenty of space for everyone to gather or have room to relax apart. The private backyard with a patio and bbq grill is the perfect spot to unwind at the end of a day Yellowstone. Conveniently located only one block south of main street, this home is within walking distance of all downtown attractions and restaurants, and only 8 blocks from the Buffalo Bill Historical Center. We really enjoyed our stay at the 1900`s Charm property. 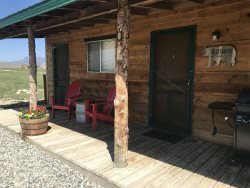 It was within walking distance to downtown Cody, was clean & comfortable, and had plenty of room for our family. Thanks! When we were having a hard time deciding where to stay we called and the agent we talked to was amazing. She was super knowledgeable about the properties and helped us find just the right place. The house was a great fit for us. It was clean and had the all the things we needed to be comfortable. We enjoyed the location and ease of parking. It was near restaurants and shopping. Sandi, was very friendly and helpful anytime we spoke. Sandi was excellent with her help in finding this property for us. Very easy to book, and information on check-in and check-out was good. No trouble finding the house. We enjoyed having an entire house close to downtown Cody--no need to take the car to places downtown. The house had everything we needed--great for us because we flew in to Billings, and had no room for any household supplies. The team is great and very helpful. Took care of all our needs,very convenient location. Great and friendly as usual, thanks. Great climate, clean rooms, great property, great people. Nightly rates are based on an occupancy of 6. You will be charged an extra $10/per/night for the 7th and 8th guest. - A cleaning fee of $100 will be charged to each reservation.